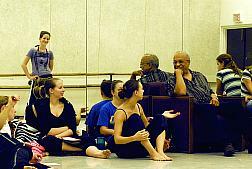 On Wednesday and Thursday, August 23rd and 24th, UMKC Dance students had the opportunity to take a couple of lengthy Master Classes with famed choreographer, Donald McKayle, at the Performing Arts Center (PAC). The two Master Classes covered the history of dance and dance composition for choreography. The opportunity for the Master Classes presented itself when Dance Director, Mary Pat Henry, contacted McKayle about performing one of his most well-known suites, "Games", for the up-coming Wylliams/Henry Fall Dance Concert. Henry requested this piece specifically once she found that it was available through Dance USA America Masterpieces program. "Games" was one of the dances listed under that program as being available for college companies. 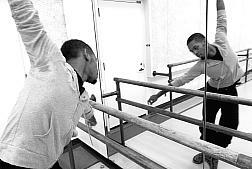 McKayle has worked with UMKC's professional dance company for 12 days working out the reconstruction of his original choreography, which is based upon children's experiences with play and with life. "Play is serious business for children," commented McKayle on "Games" to students. "It is not intended to be a metaphor for life, but rather a representation of children's experiences." McKayle created the dance very early in his career. He found the impetus for the piece out of his own experiences as a child in New York City. In his own experiences he found a narrative, a story to tell. "For the children of New York, the streets are their playground," said McKayle. "Through their fun and games, there still runs a thread of fear... the idea came out of my own experience of fear and terror that I built up into a narrative." McKayle explains that there are three uninterrupted sections to the "Games" suite. First, there is "Play", which is a thematic introduction to the piece. This is followed by "Hunger", which deals with deprivation in childhood. The last section is "Terror", which deals with the loss of innocence in childhood. The piece has no formal music, but is performed solely to the acapella singing and chanting of the dancers. Energetic and entertaining, this piece seems to tell a "story within a story" that humans can relate to both individually and as a culture. It has universal appeal, yet can speak to individual experiences. "Games is a movement and dramatic dance," McKayle explains to students during the Master Class. "It has only 10 moves... but they are varied... there is lots of variety within those 10 movements ... in that way, the piece is very economical, very efficient." Don McKayle gives and elicits constructive criticism after individual improvs, in this case for senior Ben Biswell, reflected in the mirror behind McKayle. Now a professor of dance (and endowed chair) at the University of California--Irvine, McKayle has been an extremely active and prolific choreographer. He still travels the world teaching and choreographing for dance companies in different countries. Very influential in Modern Dance, he has worked with such great names as Martha Graham and Alvin Ailey, and was recently featured in the PBS Great Performances documentary special on dance, "Free to Dance". 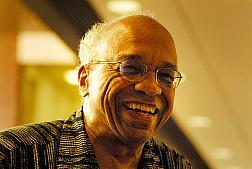 He has also worked with PBS on his own autobiographical documentary for PBS, "Heartbeats of a Dancemaker". He has also recently been named by the Dance Heritage Coalition as "one of America's Irreplaceable Dance Treasures: The First 100". McKayle has also received Tony awards for his works on Broadway and has done choreography for a number of well-known films, including Disney's "Bedknobs and Broomsticks", and "The Jazz Singer". 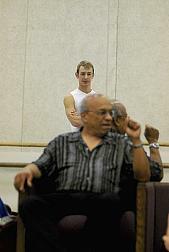 After a break, McKayle returned to his chair in the studio to work with the dance students again. "As many years as I have done this, what I always like best is to get into the studio and work with the dancers," said McKayle. "You have to have a lot of passion and discipline because this artform, dance, is a lot of effort," McKayle added during his time with the students. "People think that dance is light and easy, for some reason... but it takes hard work and discipline... and knowing a lot about yourself." The Wylliams/Henry Danse Theatre, UMKC's professional dance company, will be presenting their Fall dance concert featuring McKayle's work, "Games", for three performances. The performances will be held Thursday, Friday, and Saturday, September 14, 15, and 16, at 8:00 PM in White Recital Hall at PAC.